Who says that you need to have a bible in hand to study the word of God? With smartphones being a huge part of our everyday life, it only makes sense to have a few apps handy to help you connect with God and study scripture while you’re on the go. 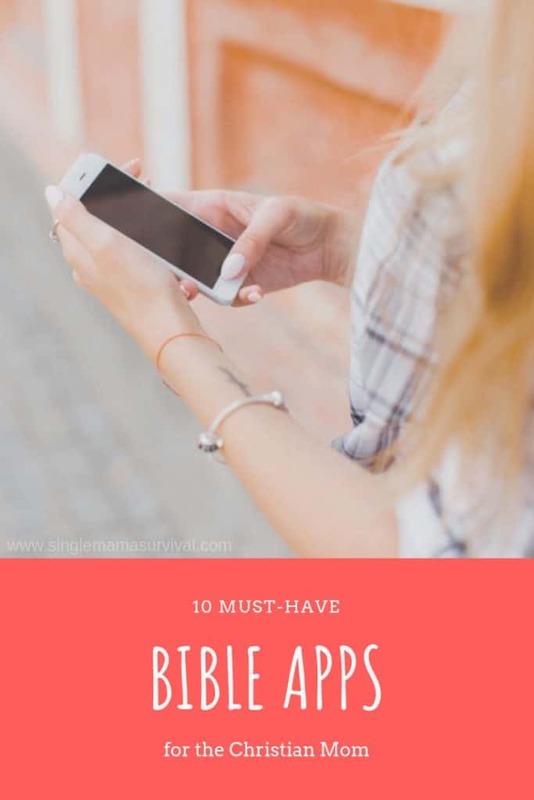 Here are 10 Must-Have Bible Apps for the Christian Mom. If you are looking for a bible app that you can keep right on your phone, this is the one to have. You are able to follow reading plans, highlight scripture, and even take notes all in this one app! This app is meant for connecting with God and is designed for the busy mom on the go. In this app, you’ll find quick devotionals and encouragement to inspire you throughout the day. There are also free bible plans. This devotional app includes daily readings for inspiration and to help you get closer to God each and every day. Out of all the devotional apps out there, this is a must for encouragement through the words of God. This app is a great way to locate your favorite verses and scriptures by simply searching with a few keywords. This app is great for studying verses and scripture. For those who don’t have the whole Bible memorized, this can be a lifesaver. This app encourages women all over the world to study the Bible together. There is a community and even the option to share content all within this one app, making it feel more like a community than a bible app. If you don’t have time to sit down and read the bible each day, having an audio version can be a blessing! There are even video options available for your favorite stories. This is also great for kids who are learning Bible stories but aren’t enjoying the part where they have to sit down and read the scriptures. This app is perfect for moms who are looking to memorize bible verses. You can use flashcards, quizzes, and even highlight your verses to help you memorize them faster. If you are looking for a prayer journal, having one you can take with you on the go can be a great idea! This app challenges you to connect with God first thing every single morning. There is a short Bible teaching each morning so you can start the day with God. This app is great for moms to have handy. This is an easy way to teach your children Bible verses and study the Bible, even if you don’t have time to make it to church or sit down with an actual bible. You don’t need to carry a bible with you in order to study the word of God. These apps are a must-have and can help you reconnect with him even if you aren’t at home.